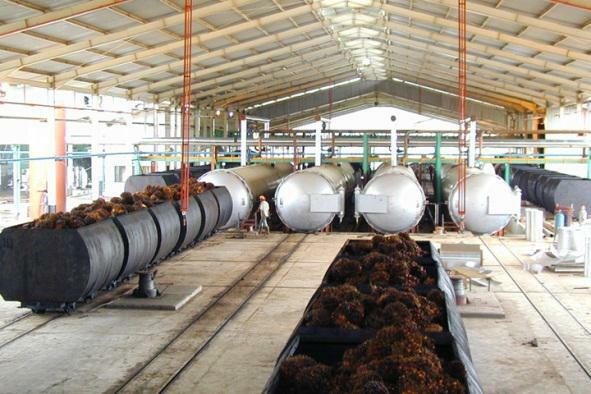 Palm bunch sterilization station utilizes high temperature (145℃, 90-120min) to cook palm bunches. Palm fruit can easily separate from palm bunches and become soft. Owing to increasing humidity of palm fruit, crude palm oil can be easily extracted from fruit. Palm kernel core can much easy separate from kernel shell, preventing enzymatic decomposition, and avoid elevated levels of free fatty acids. Rail car brings raw material from reception station into the sterilization tank. Open steam system to make high temperature sterilization to kill the yeast in raw material, destroys esterase activity, then send to the next station of threshing station. Recover condensate in sterilization tank, discharge subsequent section of the slag pit. The special silencer system design of sterilization tank vapor emission can reduce noise pollution.